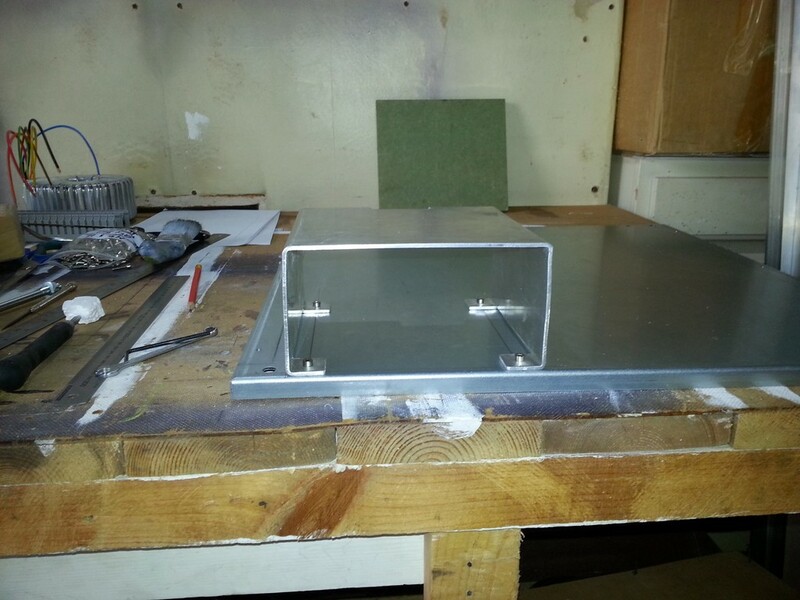 With the power supply frame completed I moved onto the mounting plate. 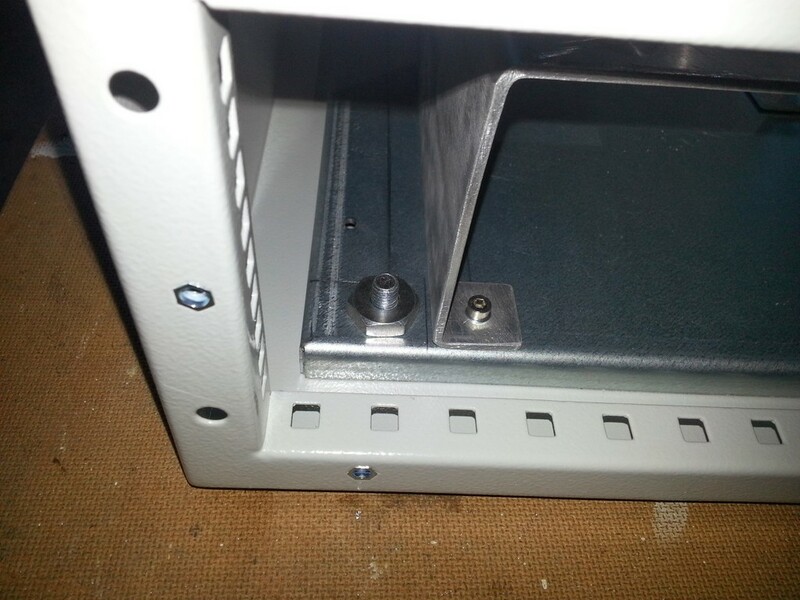 The first thing to do with the mounting plate is make sure that there’s space around the bolts that hold the plate to the case. Place the plate into the case and then screw a nut down. Use a square and the nut to make sure there’s enough space to rotate the nut then draw lines showing the exclusion area, I found a pencil works surprisingly well for this. Now, don’t make my mistake, take the lines you’ve just drawn and add at least 3mm more space around the nut so that you can get a socket head in! I can just about do the nuts up in this build but it requires some ingenious spanner and mole grip action. 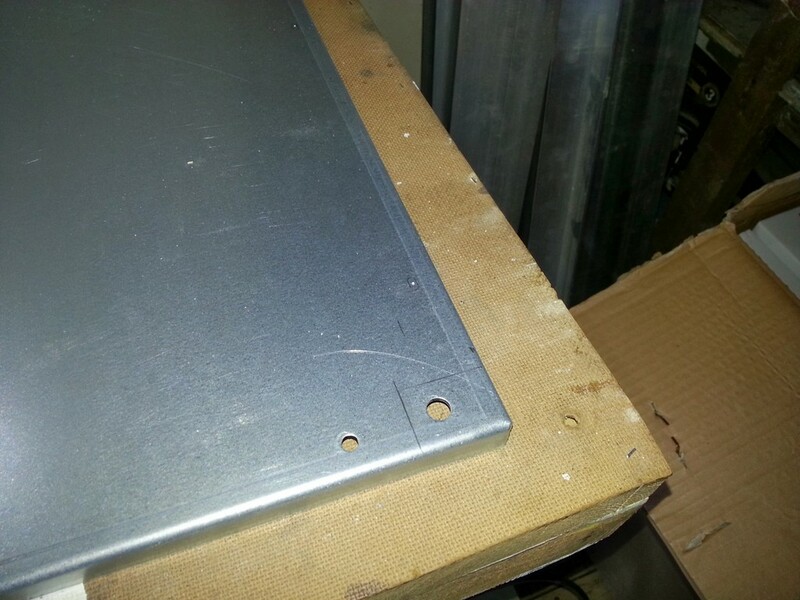 Next I laid out some trunking and drilled my first hole in the plate. I used a pillar drill for most of the holes as the plate is 3mm mild steel, your shoulders will certainly get a good work out supporting the plate while you drill it. 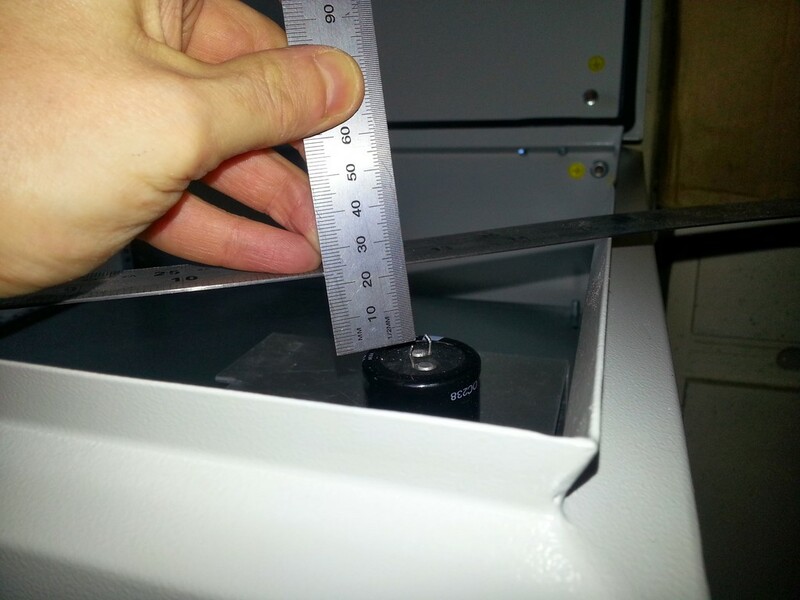 Now that I knew where the trunking and mounting nut would fall I placed the frame for the power supply into the case. The first thing I wanted to do was make absolutely sure that I had clearance above the power supply for the door. It’s not just a case of making sure the door closes it’s also a case of making sure nothing can short to the door. As the second photo shows there’s a bit over 20mm of clearance to the rim and the door panel is a little higher than that. The next step was to mount the frame to the plate, I ordered some bolts from Cromwell specifically for the task but it seems everyone goes home at Christmas as they didn’t arrive until well into the new year (and don’t buy nuts from Cromwell, they are about 20 times the price of ScrewFix). 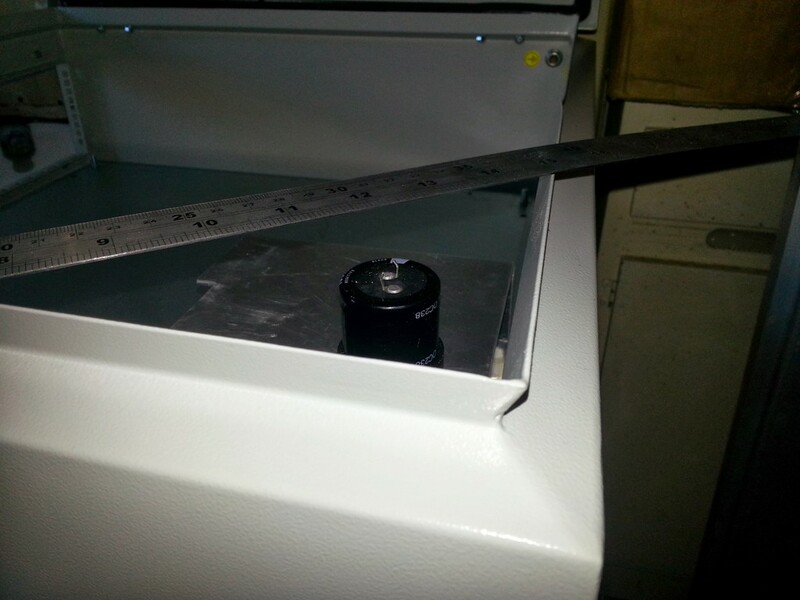 I decided to have a shot using the M4x16 bolts I for the rest of the CNC build and to my great delight there was just enough clearance under the mounting plate. Even though I’d taken photo three I was still blissfully unaware of my mistake regarding getting the nut done up tight at this point. My problem was that there was an extra hole in the mounting plate which I had to avoid so I’d moved the power supply frame up as close to the nut as I could reasonably go. Ooops. 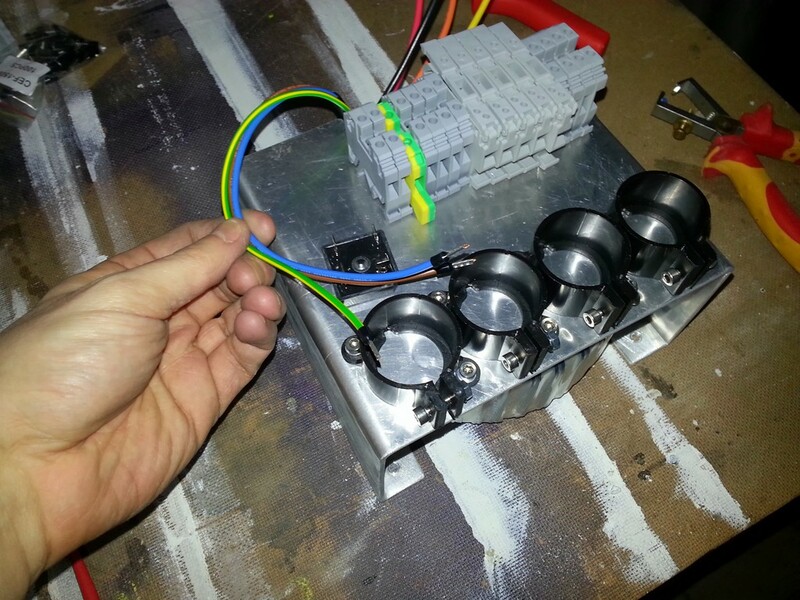 I laid out the mounting holes for the power supply frame in their ideal locations rather that where the frame indicated they should be. This means the holes pull the frame square if the bends aren’t perfect. Now that the frame was in I mounted the coil. 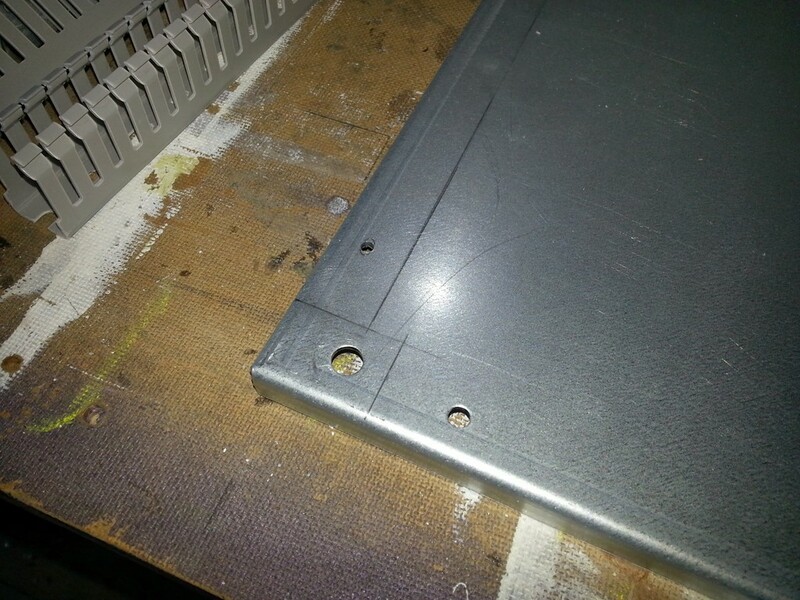 Just scribe a cross on the mounting plate using through the holes for mounting the power supply frame in order to find the centre then drill an 8mm hole for the bolt. 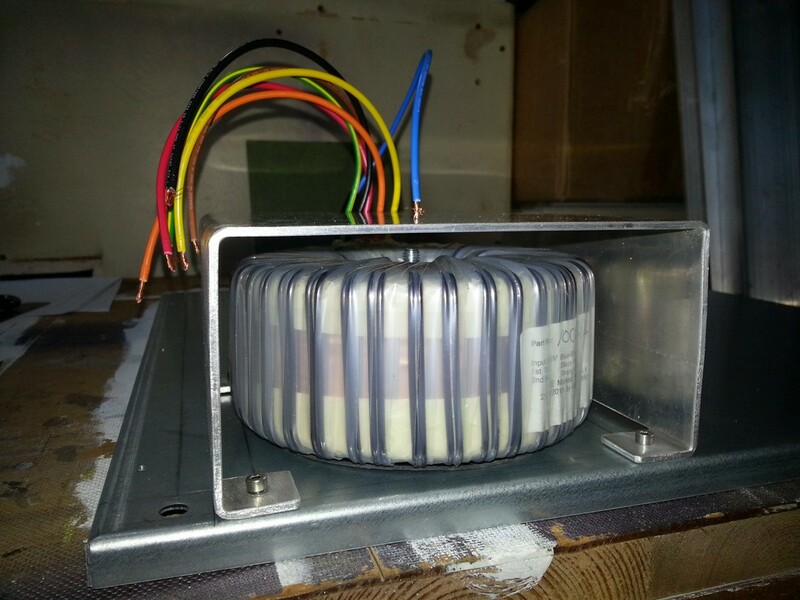 It turned out that I didn’t need to worry about the mounting bolt for the transformer as it barely stuck up above the coil. This extra space turned out to be a stroke of luck though as it meant I could again use the M4x16 bolts I had. Another stroke of luck was that I discovered I actually had enough space across the top to have all four capacitors in a line. This then allowed me to have a full width DIN rail across the top of the power supply with the bridge bolted down at the top edge. 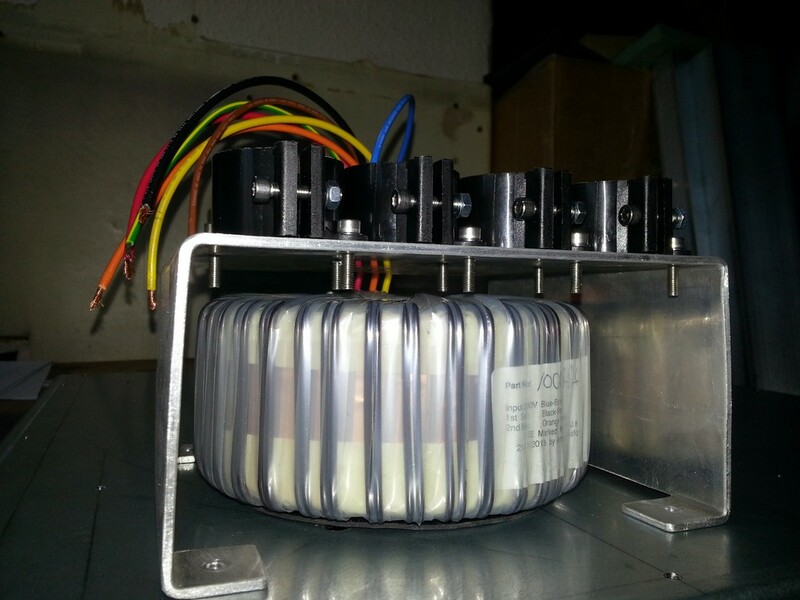 The power supply frame acts as a heat sink for the bridge. I crimped bootlace ferrules on to the primary side power cables and spades onto the secondary side while also putting the two coils into series. 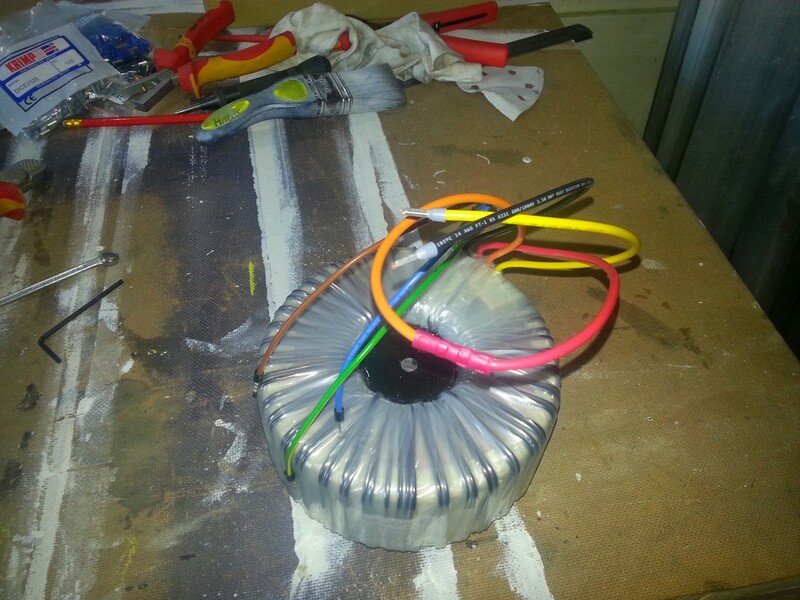 to give me 48V AC.